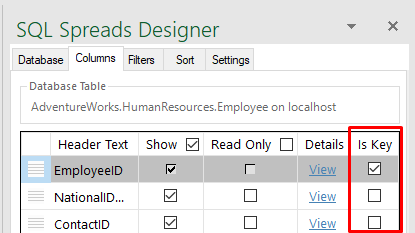 When SQL Spreads is connected to SQL Server, the available databases, tables, and views will be shown in the Database Tab in the SQL Spreads Designer. To load multiple tables into the same Excel document, switch to an empty Worksheet in Excel and select the second table. Updating data in SQL Server views are in most cases similar to updating data in SQL Server tables. When updating data in views that fetch their data from joined tables, there is a restriction that you can only update the data from one base table in each update. SQL Spreads will automatically detect the joined tables in a View and set the columns from the first base table to editable and the other columns to Read-Only. To make the columns from another base table editable, simply uncheck the Read-Only checkbox for a column from the other base table in the Columns tab in the SQL Spreads Designer. You see the number of rows in the table, in the bottom of the Database tab. The Preview of rows is only active when the Design Mode is turned on. When you turn off Design Mode and refresh the data, all rows will be loaded. SQL Spreads requires a unique key for each row in the selected table or view. The key can be a single column or a combination of multiple columns. If the key column(s) are set up in the database to be either an Identity column or a Primary Key column, SQL Spreads will automatically detect the key column(s). If the key column(s) are not automatically detected, you will have to manually specify which columns that are the key column(s). When you select a new table where SQL Spreads cannot detect the key column(s), you will be shown a dialog for selecting the key columns.